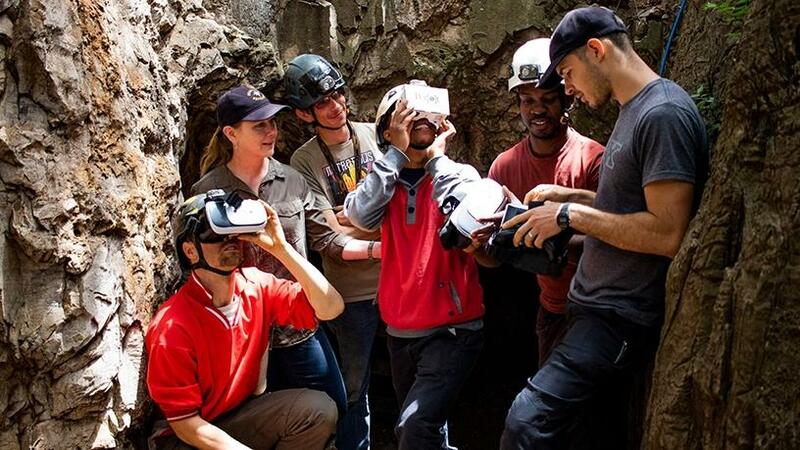 The University of the Witwatersrand (Wits University) partnered with US-based Perot Museum of Nature and Science, to develop what they call a world-first virtual reality (VR) app that explores the Dinaledi Chamber, which forms part of the Cradle of Humankind World Heritage Site in Gauteng. The Dinaledi Chamber is part of the Rising Star cave system, situated near the world-famous Sterkfontein Caves, about 40km north-west of Johannesburg. Researchers say the Dinaledi Chamber has always been difficult to reach, as the only way to get into it is to climb up the Dragon’s Back and drop down a narrow crack. The Dinaledi app, optimised for Google Cardboard but compatible with any VR headset, allows people all over the globe to virtually tour the cave few people have visited in person. Last week, internationally renowned paleoanthropologist professor Lee Berger from Wits University was joined by Perot Museum CEO Dr Linda Silver and Perot Museum research scientist and director of the Centre for the Exploration of the Human Journey Dr Becca Peixotto, for a Facebook Live news conference to unveil the app across the world. “As I would never be able to actually get into the Dinaledi Chamber, one of the most exciting things for me, personally, is that through the Dinaledi app, I can actually see and experience what it is like to be in the chamber where these wonderful discoveries were made,” said Berger. Berger dominated world science headlines last year with his discovery of fossils of Homo naledi, which was alive sometime between 335 000 and 236 000 years ago. Homo naledi is part of the extinct homonin that was first discovered in 2013 in the Rising Star cave system. The Perot Museum is a non-profit educational organization in Dallas, Texas. Its mission is to inspire minds through nature and science. The museum says it collaborated with Wits University to create an innovative experience for visitors of the museum’s newly transformed Being Human Hall. It also wanted to extend the VR journey beyond the walls of the museum and ensured the app can be used by anyone who has access to VR headsets. “The app has narration in six languages from some of the actual explorers and scientists from Berger’s Rising Star expedition. Viewers can explore and even ‘virtually’ hold fossils from the remote cave. The translated experiences are available in English, American and European Spanish, and the African languages of isiZulu, Setswana and Sesotho,” notes the museum. The free app, available on both the Android and iOS app stores, was developed by Dallas-based creative technology company Groove Jones. “It’s important for young people, from the US, SA and around the world, to see themselves as the next generation of scientists through innovative, multilingual experiences like this,” said Peixotto. Last week’s unveiling comes just six months after the Perot Museum announced its new Centre for the Exploration of the Human Journey. In April, the museum formed a partnership with Berger to serve as the centre’s distinguished science advisor. In August, the museum and Wits University signed a memorandum of understanding that launched a strategic relationship for future international collaborations. The museum says it will also collaborate with Berger and Wits University on a major traveling exhibition for 2019, which explores the study of human origins and the dynamic research of Berger’s and Peixotto’s team on Homo naledi.